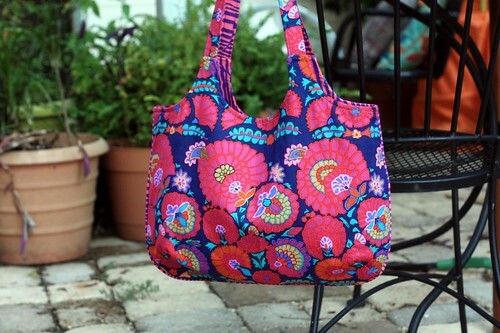 Cathy, Verena, and I have been keeping up with Thursday night sewing when we can. It’s not always every week or all three of us (back to school! hurricane! ), but we’re making a point to try, which is nice. The last few times I participated I worked on some bags. I know, big surprise! 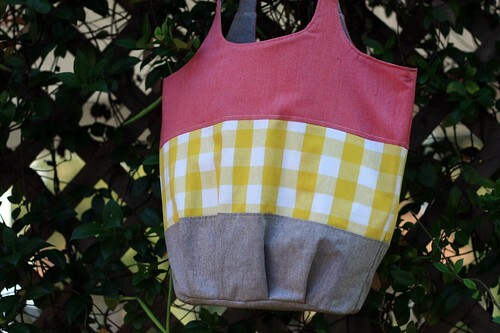 Back when I was on my color block and gingham kick I made this tote. It very much fits in with the outfits I was making for Ceci right about that same time. 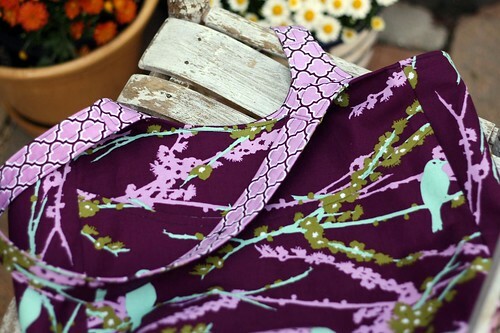 I’m still loving the fabrics and color combo, but I’m leaning (yearning) more towards fall these days, even though it is still as hot as Hades down here. It’s a good thing bags don’t go bad, I think I’ll put this one away for next spring. 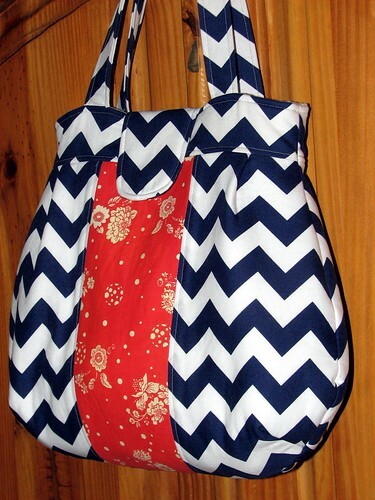 Or, I could use it as Ceci’s diaper bag, now there’s an idea. I can coordinate my baby with my bag. 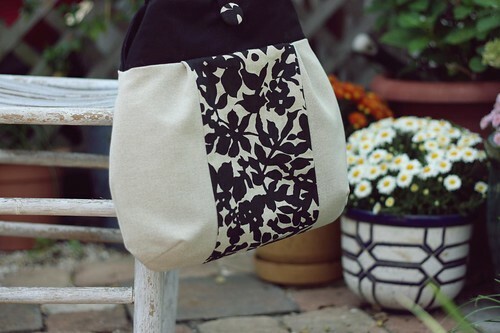 This next one is another version of the Corabelle Bag. (This poor, forgotten pattern. Seriously? I can’t believe that I haven’t listed this pattern yet. Darned busy life!) 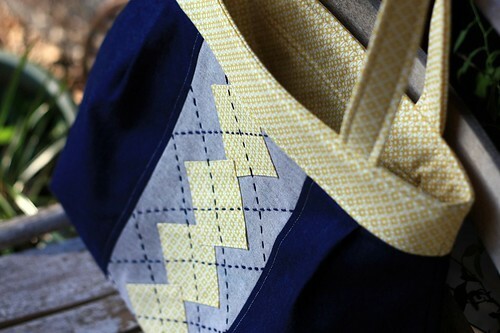 When I was planning it out, I knew that I wanted to use those 3 fabrics – the blue, gray, and yellow. It wasn’t until I started putting it together that I decided to appliqué diamonds down the center. I had a argyle-esque idea in mind. Once I sewed those diamonds on, quite wonkily at that, I thought that I had made a mistake. It looked so country to me! No, there’s nothing wrong with country, but it wasn’t the look I was going for. Cathy convinced me to keep going with it, though I was about to rip it all out. If I hadn’t sewn it on so well, I probably would have. I’m glad I stuck with it and added the hand stitching, because that totally makes it. (whoops, looks like I need two more stitching lines at the top!) It still looks a bit country to me, but I like it. 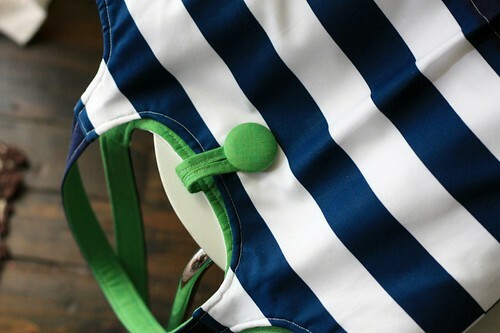 This might just be the next bag I carry around, as soon as I get sick of my navy stripes. 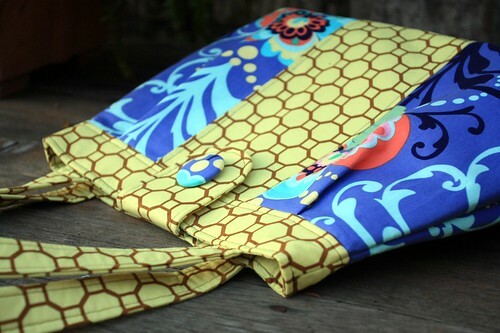 For tonight’s sewing, I’ll be working on yet another bag. I’m only in prototype phase. 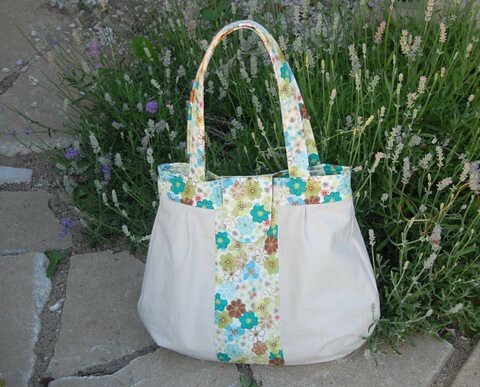 It’s a simple tote that I’d like to use for a class I’ll be teaching locally in the near future. Eek! There's also a quilt top I started this past winter that needs some attention. 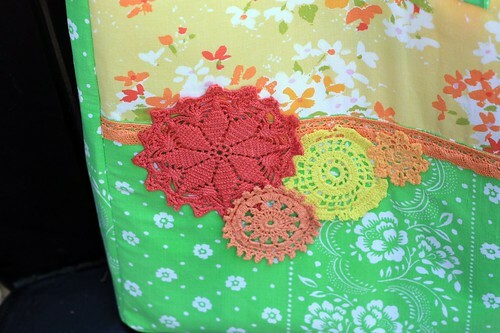 Or maybe I’ll just visit and catch up on my crochet granny squares. Believe me, I have no shortage of projects to work on. 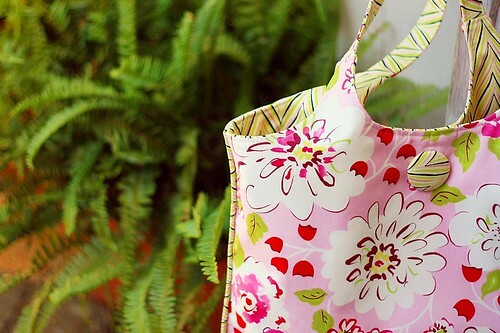 Anyone else have a little Thursday night sewing planned? What are you working on? 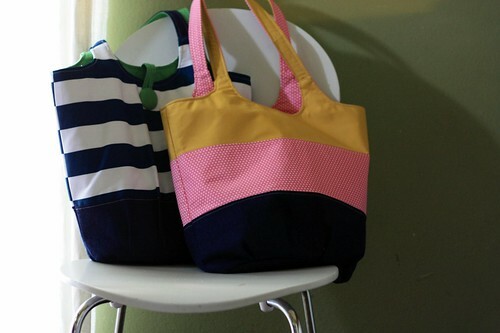 Before I show you another one of my Corabelle Bag versions, I'd like to show y'all what my testers made (love them!). 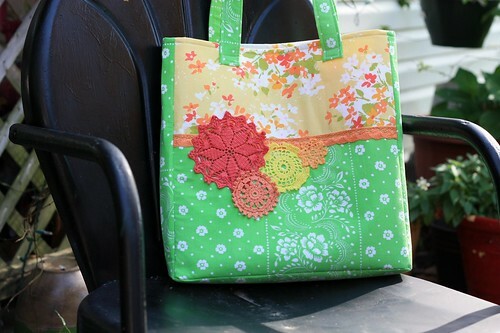 First up is this stunning bag by Amanda. I’m pretty sure I literally gasped when I saw this on instagram. I love how she used the horizontal stripe on the center panel. It’s so stylish! 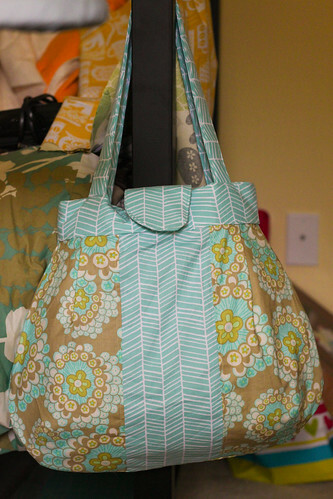 Amy calls herself a beginner bag maker, but I think she did a pretty fantastic job. She used a great fabric combo. I’ve always been a fan of that Joel Dewberry herringbone print. Peggy made a nice neutral version. I love those sweet flowers paired with that solid. 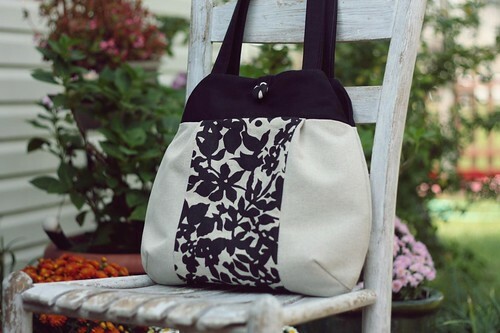 It looks like this bag could carry you through spring, summer and fall. Last but certainly not least, check out Sarah’s bold chevrons. 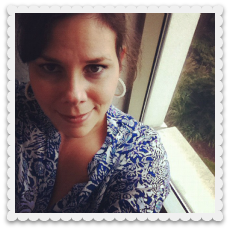 And it’s navy and white – my latest favorite color!! 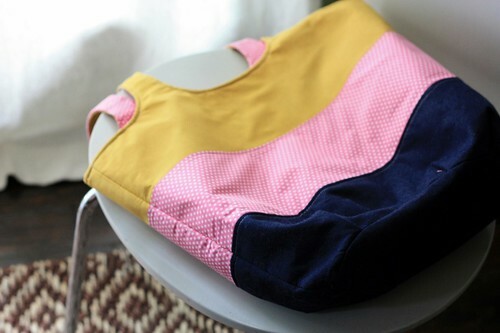 This looks like a fun, summery bag. 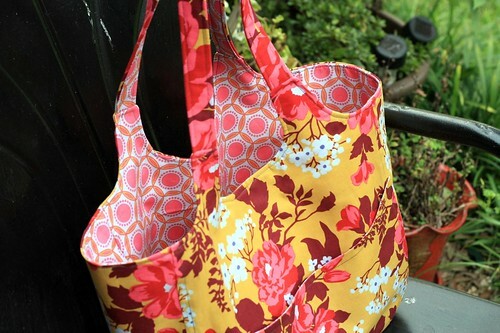 Thanks again to all my testers for taking the time to try out my pattern. They all did a wonderful job! 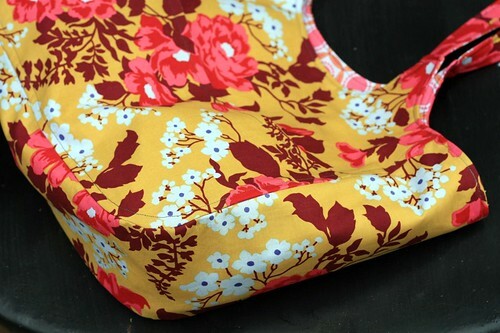 Remember waaaay back in the spring when I asked for pattern testers for some new patterns? Well, my testers were awesome and got on the job pronto, but me, not so much. Getting things done in a timely manner hasn’t exactly been my strong suit lately. Honestly, the pattern is ready. Thanks to the feedback I received from my testers, I was able to get it done. What's been holding me up are samples (and taking photos of them). I'd like to make one more version before I release this one out into the world. 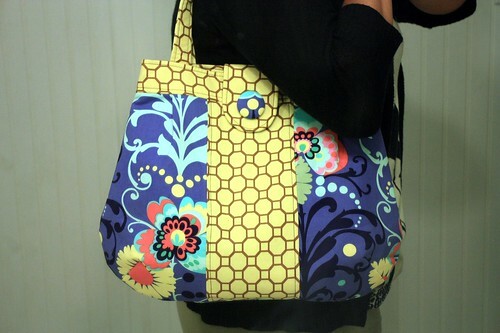 This bag here is one that I made before I ever started writing the pattern, but I don't think I ever showed you. 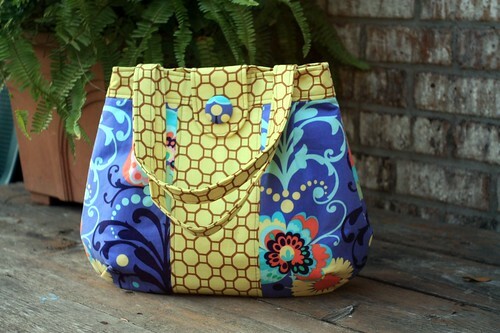 Thankfully, I think my sewing groove is back, so you shouldn't have to wait too much longer. 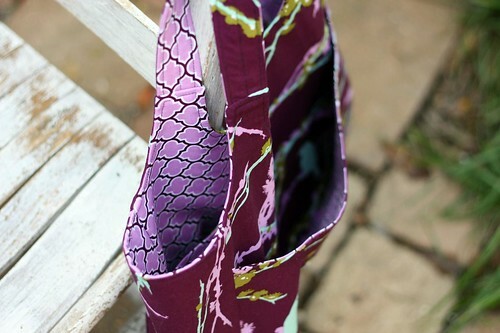 I'm picking fabrics out as soon as I hit the publish button on this post. I know, I'm a big ole tease!! Remember when I said that color blocking was floating my boat right now? 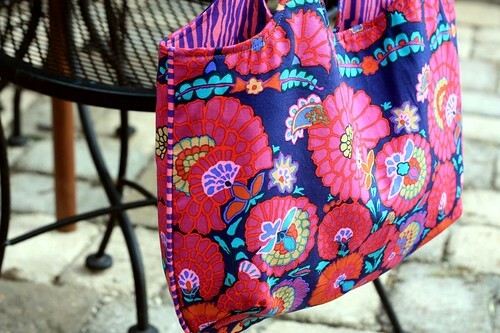 I’m still all over it, turning that into my latest bag obsession. 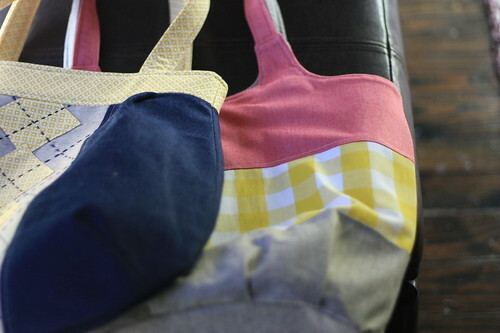 Yeah, all those fabrics were in preparation for some bag making. My first version used a navy denim-ish fabric paired with a pink dot and solid gold (ha, I just got a flash back to the Solid Gold Dancers). I love the colors, but as usual, it was in need of some tweaks. I wasn’t entirely happy with how the bottom and bottom pleats turned out. Part of it was user error in sewing a circle bottom, but I really didn’t like all that bulk caused by the pleats. It’s still a really cute bag, which Lily had no problem claiming as her own. 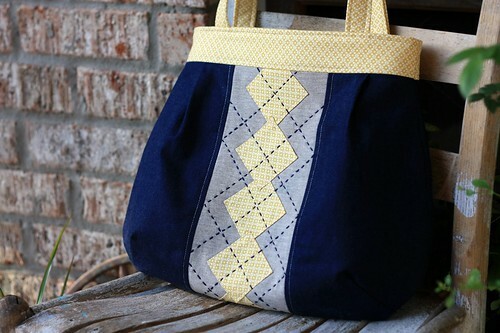 For my next version, I used a navy stripe and the same denim-ish fabric. 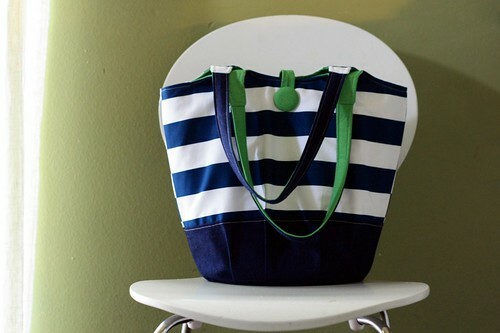 I would have made the entire bag out of the stripe (LOVE the stripe), but I envisioned that white stripe getting mighty dirty on the bottom, and the fabric is an apparel weight, so it needed something heavy duty on the heavy wear parts. I thought about not interfacing it at all to alleviate some of that bulk from the pleats, but like I said, being an apparel weight it needed it. And here I am now on version #3. 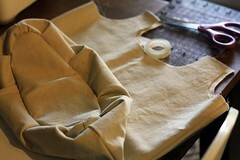 This time there will be no pleats on the interfacing and lining. It’s not sewn up yet, but I feel like this is the one. *This* was what I was going for. I’ve got all kinds of ideas for this design, so I hope you don’t mind a parade of bags in the upcoming weeks. I've haven't been the best at follow through lately, but what do you think, a new pattern? 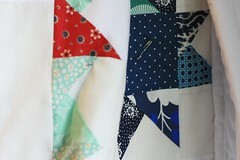 When I started my star quilt I thought that it would be a summer-long project. 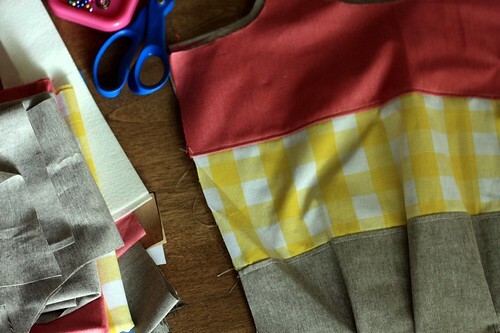 Back in the day (ha ha), I'd whip a quilt out in no time, but considering the amount of sewing I get these days with little miss get-into-everything I knew that wasn't going to happen. Much to my surprise, I'm making pretty good progress! 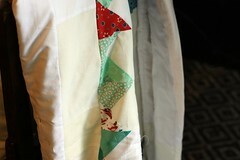 Over the weekend I managed to finish my quilt top, make the back (pieced), get the quilt pin basted, AND start quilting. Are you impressd? I sure am!! The best part was that it wasn't a monumental feat. 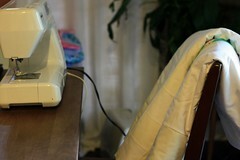 I kept my machine out and sewed a little here and there when I got the chance. There was lots of cooking, baby wrangling, and crochet too, but I'll save that for another post. I did make a few conscious decisions to ingnore the laundry and some dust bunnies, but you've got to make sacrifices every now and then, right? I think I'm most impressed with the back. I used every single bit of the extra front pieces that I cut in error. I love the look. Here she is, a little bit unrolled for ya. I'm only barely into the quilting, and now I remember why I don't quilt on this machine. It's a pain in the a$$!! I need to spend some time upstairs with Richelle (while she's still up there) because she knows how to quilt. I miss her speed! For the first time in months, we had a weekend with no commitments. Absolutely nothing planned. It had been so long since we had that luxury, I hardly knew what to do with myself. After a leisurely Saturday morning, I pulled out a sewing project, one that has been waiting in the wings almost as long as we’ve had full weekends. 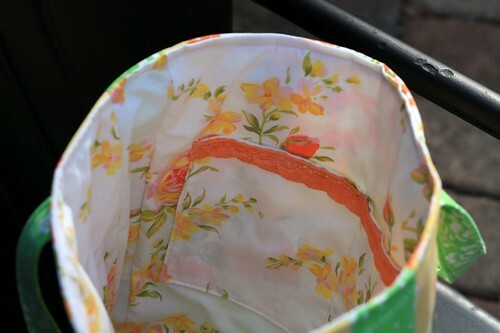 Some vintage sheets + colorful doilies = time for a new bag. 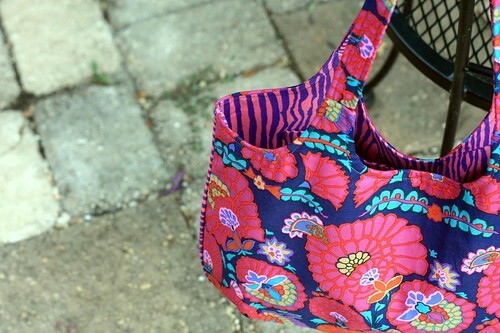 A friend of mine has been carrying around a tote that seemed like the perfect size. After eyeing it for a while, I asked if I could measure it. Anyone who didn’t know me well would probably find that an odd request, but she thought nothing of it. I wish I had taken better notes when I took those measurements because when I pulled out my notebook I was lacking detail. Ah well, it was good enough to make something work. 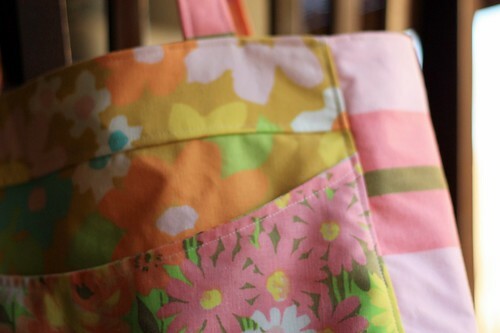 I haven’t sewn a bag like this in a while. Assembling a separate square bottom with separate side pieces required me to stretch my brain a bit. I usually take the easy way out with a boxed corner, but this time I wanted more structure. I’m pleased with how this turned out. 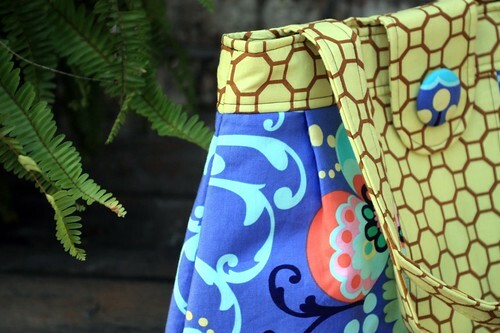 I love the fabric and color combination. 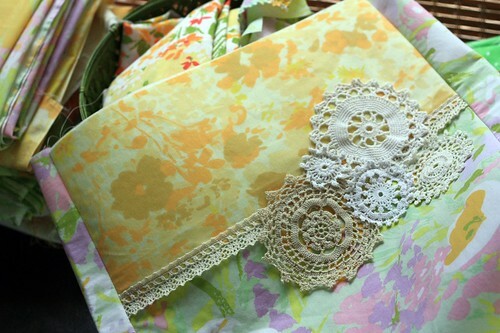 And I used doilies! I like it so much that I started another one. It's more than half-way done, but time ran out on me. I can't handle late night sewing like I used to, so I had to put it away and go to bed. It may only be Tuesday, but I'm already looking forward to the next uncommitted weekend. It feels good to get back into the groove! For some time now I've been feeling the urge. Inspiration. Desire to MAKE something. I haven't felt that in a while. My latest issue is figuring out HOW. Babies sure are time consuming, aren't they? The stars must have been in alignment because night I got my chance. As soon as Ceci fell asleep, I made my way to my sewing room. My fabric stash is totally uninteresting to me right now, so I went to my sheets. I gathered some of my favorites. Bright and colorful is what I was feeling. 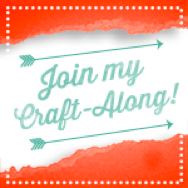 Once my fabrics were chosen, I started cutting. I felt like I was playing 'beat the clock' to get as much accomplished as I could before Ceci woke up. I managed to get everything cut out. This morning my crew all went back to school. It was just me and the babe. As soon as she went down for a morning nap, I got busy. Lucky for me, she took a nice long one. I was almost finished, just one last seam to sew when she woke up. That's okay, I knew I'd get my chance later. And I did as soon as the kids were home from school. Just a few minutes of entertainment by the older ones was enough. The bag was finished! 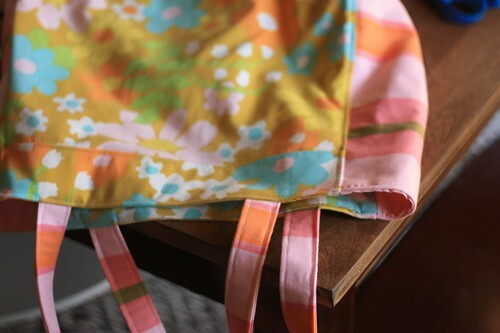 When I started I wasn't sure what the purpose of the bag would be, but as I started playing with the fabrics I knew that it would be a perfect diaper bag. 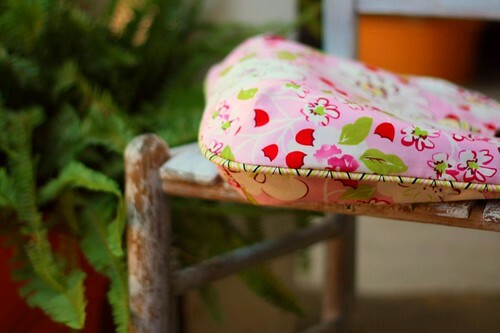 Girly, sweet, roomy but not too big, re-purposed materials - everything I could possibly need! 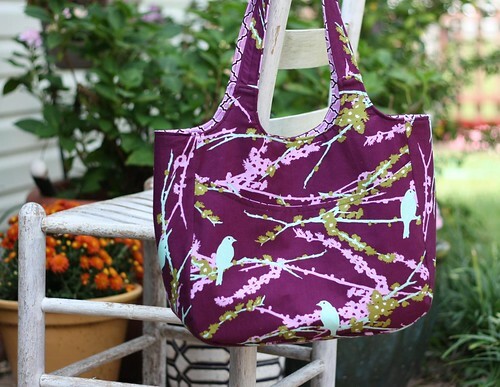 The final stop on my 'summer bag tour' is the Nanette tote. 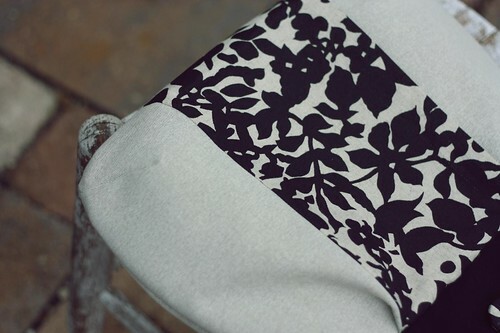 I don't think I ever mentioned that along with re-making all my samples, I also reformatted all my patterns to make them uniform. 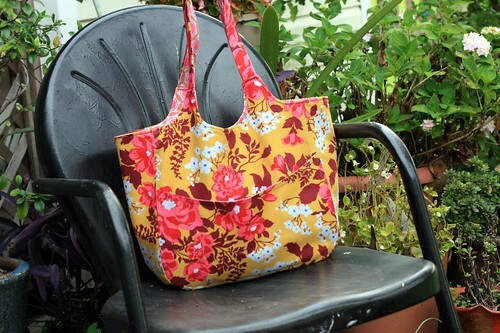 When I got to the Nanette tote I decided to add something new, an alternate rounded bottom with darts, which I came up when I was making my blooming bags this spring. I think I like the rounded bottom better than the original boxed bottom, but that's just a personal preference. If you've purchased this pattern in the last few months, you received the new pattern piece, but if not, just email me and I'll send it to you if you want. 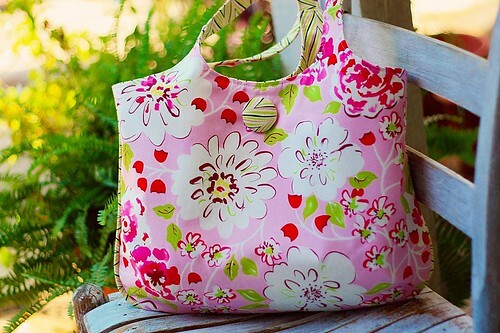 Now this bag here, I'm quite smitten with. 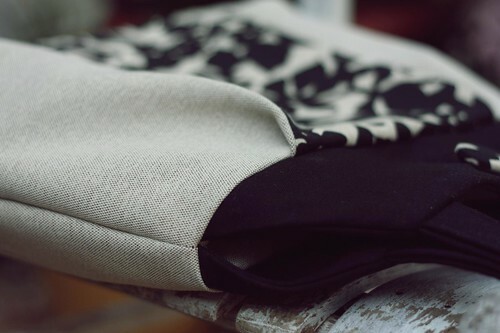 That black print is a piece of a napkin I bought at Crate & Barrel a few years ago. I only had a small piece, so I pieced the front of the bag to showcase it. I LOVE how it turned out. 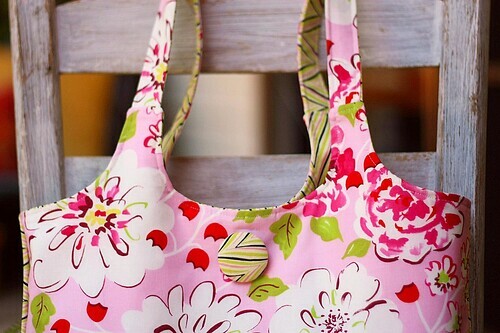 Moving on to the dance bag for Lily...it only took me a month, but I finally got her dance bag made. Remember the first version? I made some tweaks (don't quite remember now what they were), but I think they worked. Now I need to find that file. I made the tweaks & printed it right after the first version, and well, that's been a month. I'm not the most organized person in the world!! The hard part was finding the right fabric. She wanted purple, teal, and lime green. Um, I'm glad we decided on what we did. 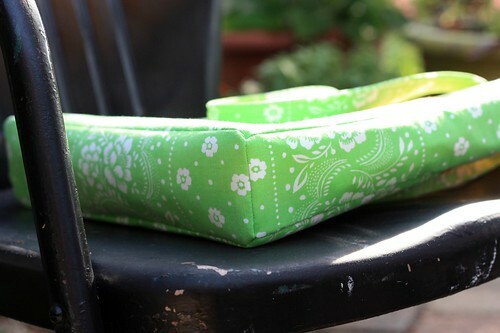 I planned to add more pockets and pocket divisions for her shoes, but I knew she wouldn't use them, so I made it as is - one curved outside pocket, one inside pocket. She loves it.